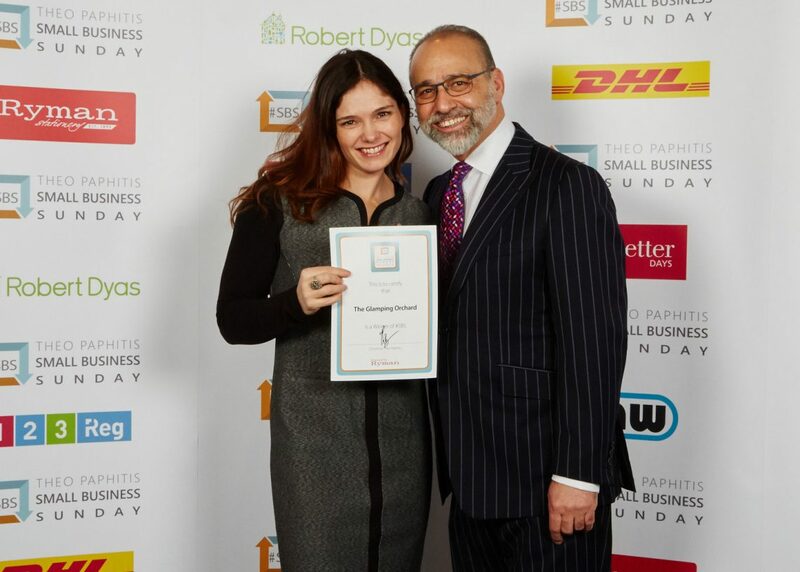 The Glamping Orchard is thrilled to receive a ‘Small Business Sunday’ award from former ‘Dragon’ Theo Paphitis. In February Ali Parker from The Glamping Orchard travelled to meet Theo Paphitis at the 2017 #SBS winner event in Birmingham. As a winner, Ali became part of the #SBS club and was invited to the annual business event held at the ICC in Birmingham, in February, where The Glamping Orchard received their award personally by Theo. The day showcased the very best of small business with workshops, networking opportunities and the chance to speak with business experts throughout the day. Businesses were also able to question a panel of experts to find out invaluable information during the event with a question panel consisting of Theo, Dragon’s Den Deborah Meaden and JML founder John Mills.